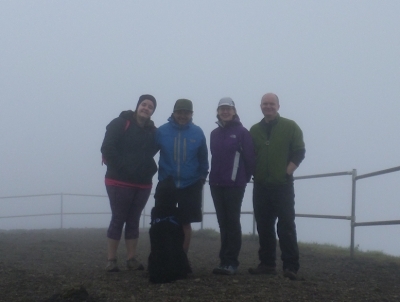 Four intrepid Santiam Alpine Club humans, and one equally intrepid Santiam Alpine Club dog, braved the rainy forecast and headed out to stretch their legs on Saddle Mountain, near Seaside, in the Coast Range. I was proud that though our group was small, we had 100% attendance; the question of canceling due to the weather didn't even arise. I'm not going to tell you the weather was good, but it could certainly have been worse. It was raining as we began, but mostly held off during the hike, so we got wet but not soaked, and we did not have to waste any time applying sunscreen. Unfortunately, through the mist, there was little we could enjoy of the view, but we had all been there enough to imagine what we were missing. We did get to enjoy many spring wildflowers blooming along the trail. Everybody made the ascent without too much difficulty. The hike took a little less than four hours, at our fairly leisurely pace, and I believe everybody enjoyed the fresh air and good company. Hey, everybody ready to hike? I just opened the event for 'verifying', which (if you're new to this) means that a box shows up above asking you to update your contact details for the event, and to click the button so we know you're paying attention and still planning to go... so please come by the event page and find those buttons! The weather forecast I just saw says showers early turning to steady rain in the afternoon. That is for here, so probably similar at Saddle Mt. If that is the case, I would prefer to go lazily early. I'm looking at the forecast for Seaside... it'll be more similar to the hike, being on the coastal side of the mountains. The wetness prediction seems to have drifted more toward the middle of the day at this point... not sure we can really schedule to avoid it, with any certainty. Ok, I put in the departure time above under "Team-Only Information" (I usually only share the meeting time and place with the group, so that people plan with the group rather than showing up unexpectedly, not that it particularly matters in this case. That part of the page, with contact details and other private information, is only shown to participants). Cynthia, where are you coming from, do you want to join up with my car? I have room for all four of us if you want to join too, Adrian and Kristine. I added our carpool meeting point above. Hey Fritz, Adrian and I are bringing Muttley tomorrow so we're going to bring our own car. Thanks anyways! See you tomorrow! Ok, see you at the trailhead!